We would like to invite you to share the love of the German Shepherd breed with us. Our home is located in Southern California on 3 acres nestled in the hills just north of the Temecula Wine Country. Our family has spent more than 20 years with the German Shepherd breed and the last decade showing and breeding. Our AKC registered German Shepherds and German Shepherd puppies are from German import, show line working dogs, which possess the fundamental intelligence, beauty and grace we all know and love. The focus of So Cal German Shepherds is to produce quality puppies from multiple generations of healthy parents that have the necessary certifications for breeding. Producing healthy, beautiful and intelligent German Shepherd puppies, with strong nerves and courageous temperaments. Our dogs do not just need to meet the German standards of workability and conformation, but also the American family’s needs for a well-rounded companion. The result of this breeding is a puppy which is wonderful with the children, confident and stable when in public, and ready to protect its family when at home. Our GSDs are not "just dogs"; they have shown and placed well in both national and international German conformation shows, including multiple times at the BSZS World Sieger Show in Germany. However, they remain as participating members of our family and enjoy trail riding with the horses, taking trips to the beach, going camping and lounging in the living room. From working with the live stock to standing out in the show ring, our German Shepherds are truly a versatile breed. 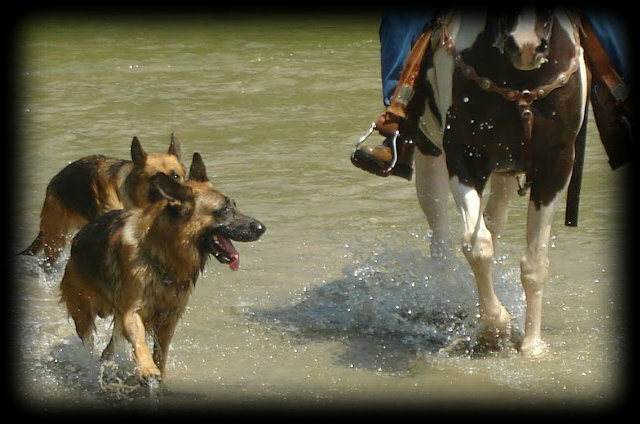 Please visit "Our Family" page to learn more about about our German Shepherds’ lifestyle. and look forward to you becoming part of the "So Cal Extended Family". If you are interested in making a So Cal German Shepherd puppy part of your family, please visit our "Puppies" page to see our available German Shepherd puppies and our planned litters.